PATNA: Bihar chief minister Nitish Kumar is currently facing, perhaps, the toughest challenge of his four decade-long political career. With the RJD flatly rejecting his demand for resignation of deputy chief minister Tejashwi Yadav who has been named an accused in a corruption case by the CBI, Kumar’s much-flaunted claim of his zero tolerance on graft stands totally exposed now, thus badly denting his image of being a “Sushasan Babu” (no non-sense man). 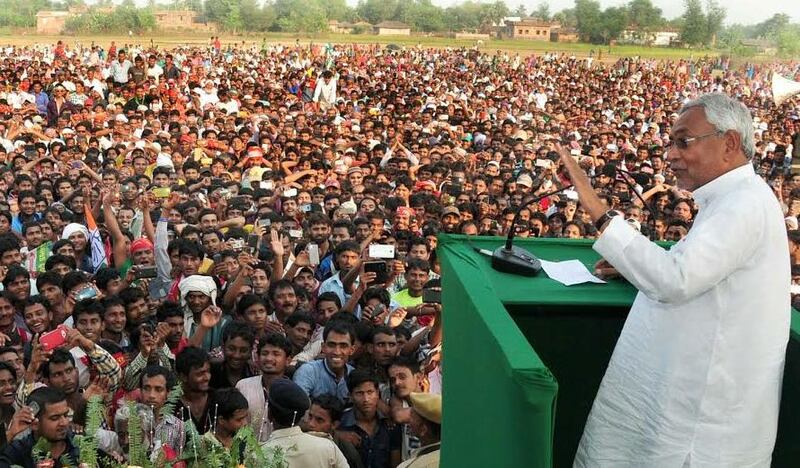 His continuation in the government despite the RJD taking no note of his party’s repeated demand is slowly giving the impression among the masses that Kumar is no different from other politicians in the crowd and that his big talks about graft is only a “sham”. The RJD remains adamant on its stand of not asking Tejashwi to resign despite the chief minister calling on Congress vice-president Rahul Gandhi on Saturday to intervene in the matter. Tejashwi happens to be the younger son of RJD chief Lalu Prasad. The problem with the chief minister is that he had forced at least four of his ‘tainted’ colleagues to resign from his cabinet in the past to convey the message that he can’t compromise with the issue of corruption. It’s this “precedent” which is now proving to be the albatross around his neck. Kumar now urgently wants his deputy to resign in a bid to convey the message that his fight against corruption still continues despite being in the company of the RJD chief Lalu Prasad facing multiple corruption cases but his ally has made it clear Tejashwi will not resign. The development has left the chief minister in a really critical situation as he has very few options left before him. His party has not enough number to form government on its own. To form an alternative government, he will have to get the support from the BJP but the latter too has been very cautious about his conduct given his past record when he broke 17 year-old alliance with the saffron camp in June 2013 without any reason. Observers say the BJP no longer looks interested in letting Kumar continue in office, it only wants him to break alliance with the RJD. There is another bigger risk involved in breaking alliance with the RJD. “Such act on his part for the second consecutive time in a row will make people believe he can’t be trusted anymore as he keep changing partners even before completing his tenure,” said a political expert adding, “This will also be treated as his surrender before Prime Minister Narendra Modi over whose issue he had walked out of the NDA four years back”. There is again a greater chance of losing his support among the minority class who reposed faith in him after he joined hands with the RJD president. In recent past, Kumar was seen “flirting” with the BJP and supporting just each move of the Narendra Modi government whether it was the surgical strike, demonetization drive or the NDA’s presidential candidate Ram Nath Kovind. Reports said the RJD leadership has apparently come to realise that the chief minister just wants to do “pressure politics” by frequently supporting the BJP policies, and hence has summarily rejected the JD-U’s demand seeking resignation of Prasad son. The whole idea, report said, is to “tame” the chief minister sailing on two boats. The RJD leadership believes it’s a two-way loss for the chief minister—he will be suffering political reverses if he joins the company of the BJP or opts for staying further in the company of the RJD without getting his demand considered. The situation is indeed tricky for Bihar’s “Chanakya”. He has already lost a major support from the Congress by voting for NDA’s presidential candidate against opposition’s Meira Kumar.